Setback for the virtual world software as Sony pushes release into the new year. 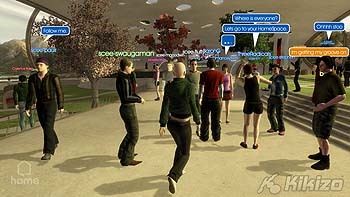 Sony's much-hyped virtual world, Home, will not make it out before Christmas, the company said in Tokyo on Thursday. Kaz Hirai, the head of PlayStation, delivered the news at a press briefing at the annual Tokyo Game Show running this week. According to a report by the Associated Press, Hirai said that Sony "wanted to wait until we could offer what would be totally satisfying for consumers". Home is a virtual world where people will be able to hang out, play simple games and find other players to challenge in online games. The software, which will be available as a free download, will integrate straight into the PlayStation 3's Xross Media Bar user interface. Sony has been tinkering with Home for some time now. Recently the company showed how you will be able to interact with Home through their mobile phones. You'll also be able to download and watch movie clips and decorate your own virtual space. Sony has not said exactly when it is going to open Home up to the public. The software is being beta tested right now and is due sometime during the spring.